Hi, in this tutorial we'll see how to create accordion menu in bootstrap. Accordion Menu is one of the important components of Twitter Bootstrap 3 Framework, and is a stacked list of items such as windows, buttons, labels, thumbnails etc which can be expanded and collapsed though only one accordion window will be visible at a time. To add a collapsible bootstrap accordion menu, we'll stack two or more panels one after another inside a panel group. Only the panel heading will be visible and the body will be collapsed and if we click on the heading of a particular panel then the body section will be expanded for the particular panel and the rest of the panels will be collapsed to show only the heading links. Two data attributes data-toggle = "collapse" and data-parent = "#accordion" should be used to make the bootstrap accordion menu collapsible. 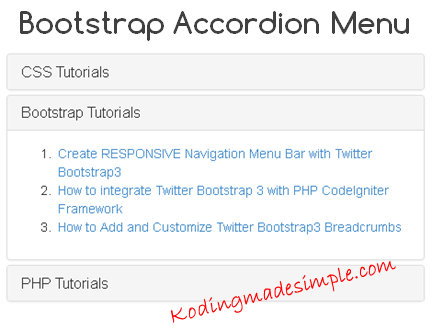 Hope you find this Twitter Bootstrap Accordion Menu Example Tutorial useful. Please don't forget to share it in your circle. Where do I find the three includes referenced in this script? One CSS and two java Scripts.